Tigger has recently found a love of all things Marvel, with help from his Daddy. Enjoying learning about each of the different superheroes, from their superpowers, their enemies and of course their amazing accessories. On a recent trip into the city we popped into our local Disney Store to see what new and exciting things they had available for Christmas. The Marvel Avengers section captured Tigger’s interested especially the Captain America Avengers Attack Shield. Having mentally added to his Christmas wish list along with Disney Infinity 2.0 for Roo we headed home. Having previously seen the Captain America Avengers Attack Shield within our local Disney Store, Tigger was so excited to come home from pre-school and see it sitting on the sofa – cue chants of ‘open it, open it’. Opening up the Captain America Avengers Attack Shield I was surprised at just how easy it was to unpack as usually toys are screwed into the box or held with cable ties, however this had a couple of strings tied at the back and was undone easily. foam discs included within the pack. A simple squeeze of the trigger has the discs shooting out upto 6m! Tigger loved the Captain America Avengers Attack Shield, declaring that he needs a Captain America costume from Santa so that he can save the world! 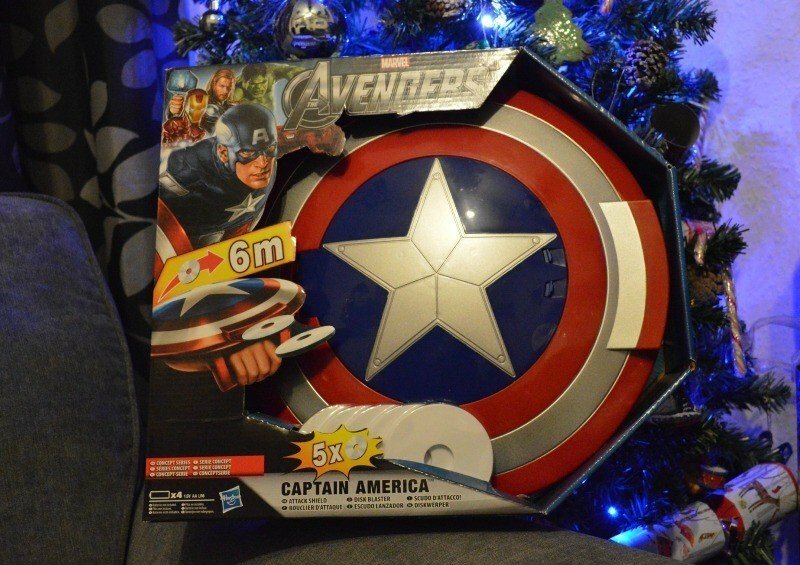 Disclosure: We received a Captain America Avengers Attack Shield FOC for the purpose of review.